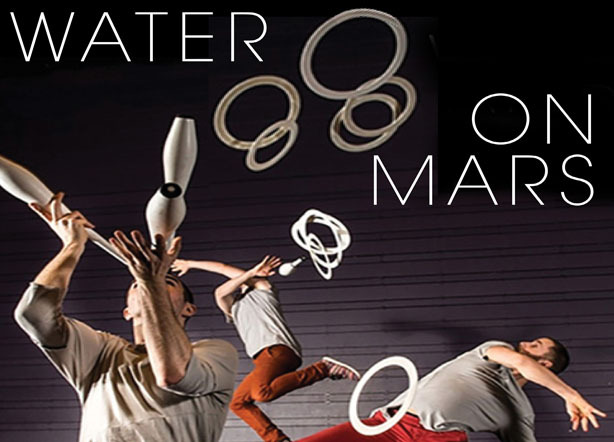 WATER ON MARS – BETHLEHEM PA May 11TH, 2019 | Love Productions Inc.
Water on Mars is a show of pure juggling, built using juggling’s natural drama, humor, and airborne geometry. The performance was created by three American/Swedish jugglers who have each spent over 15 years researching how to combine juggling with music, acrobatics, snow, chocolate, tap dance, and 400 roles of tape. When these three work together on a single project it’s like 3 Jackson Pollock’s sword fighting with paint covered brushes. The company is based in Stockholm, Sweden and consists of the three jugglers Wes Peden (USA), Tony Pezzo (USA), and Patrik Elmnert (SWE).